Today I have an interview with Heather Huffman, whose latest book, Roses in Ecuador, was just released last month. As much as I love the early writing process and getting to know my characters, nothing will ever compare with the rush that comes the moment it all falls into place. In a flash of inspiration, sometimes early on, sometimes fairly well into the book, I suddenly just know who they are and where it’s all heading. I love, love, love that moment. I was a total hold-out on ebooks for the longest time. I adore the feeling of a book in my hands, the paper, the aroma… there’s something very comforting about it all. But when I was given an ereader as a present a couple of years ago, I quickly realized that it was an amazing portal to limitless adventures. I read more now that I have it, and I read a wider variety of books. As a writer, I think ebooks are brilliant. I’m thankful to have a publisher that believes books should be readily available to readers, so they keep ebook prices reasonable and often run free promotions. There accessible pricing strategy has helped me find countless readers I wouldn’t have found otherwise. Sure, there’s a romantic notion about seeing your books on the shelves of your favorite bookstore, but what really matters to me as a writer is that my stories find readers, and ebooks help me do that. There’s always a real person behind my characters, although sometimes just a sliver of reality makes its way to the page. Often, with my heroines, the emotional battles they’re facing are mine. And sometimes, it’s a direct correlation. A good example would be Kate’s friends in Ties That Bind. They’re directly based off one of my editors, Erica, and my graphic designer, Emily – two of the most amazing women I’ve ever met. I start at page one and plunge forward. Sometimes, like when my back’s against a deadline and I’m stuck, I wish I could jump around, but the story unfolds for me as I write, so I tend to go in order. Again, I’m super thankful for my publisher, Booktrope. They allow me to have more say in the cover than many writers have. I work very closely with my cover designer and Booktrope marketing to find a cover we all like. The process can sometimes be a bit stressful, but for the most part, it’s a lot of fun and I’m thrilled to be a part of it! Heather Huffman writes contemporary romance and romantic suspense with strong female leads who refuse to lose hope. She sees her books as a way to not only entertain, but to also raise awareness of the realities of modern day slavery. She shares the passion of her resilient heroines to make a difference, and so dedicates both her time and a portion of her book royalties to organizations that fight against human trafficking. Heather was born and spent her early childhood in Florida before moving to the beautiful state of Missouri. Her greatest joy, aside from writing, is working the land on their homestead in the Ozarks and tending to her horses, chickens and goats with her husband and their three boys. Heather is the author of Throwaway, Ties that Bind, Jailbird, Suddenly a Spy, Ring of Fire, Tumbleweed, Devil in Disguise and Roses in Ecuador. You can find out more about her family’s adventures as they strive to live off the land, as well as her writing and charitable work on her website. Unknown to each other, they each escaped to the heart of Ecuador to make the world a better place, having sworn off the possibility of love… but disaster pulls them together. Jane Russell is certain she’s had enough heartbreak for one lifetime, and love is the last thing on her mind when she arrives in Ecuador. Focused and determined, she settles in to write a book on the local jaguar preservation. Devon McAllister, the wealthy and handsome son of a corporate mogul in the U.S., has broken his share of hearts despite his best intentions. He moved to Ecuador to escape his father’s destructive greed and pursue his passion to do good in the world, opening a fair trade rose plantation. When the jaguar preservation comes under attack by what appears to be a group of angry locals, Devon jumps in to help Jane fight for the animals they love. As the danger grows, the motives of the attackers are revealed to be much more sinister than either could have ever imagined. 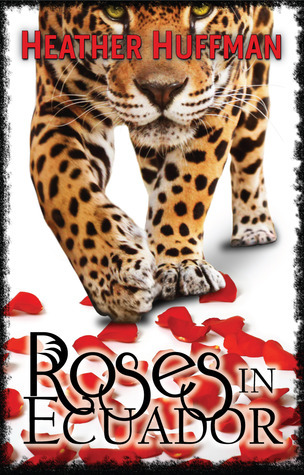 Unsure of whether they’re more frightened by the prospect of love or the danger to the jaguars, they must decide whether they can open their minds–and their hearts–to trust again.